These beautiful pears are a sweet ending to a holiday meal. 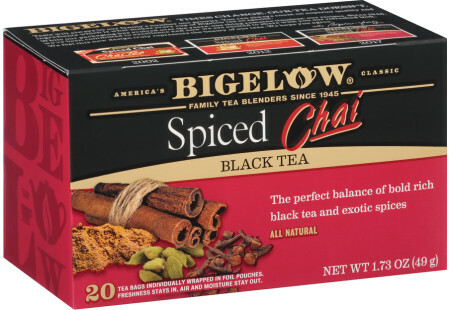 Bigelow has added the flavor of Spiced Chai Tea to add to the aroma. Over medium heat, add boiling water to large saucepan. Add Bigelow® Spiced Chai tea bags and steep for 5 minutes. Add sugar, bring mixture to under a boil, once sugar has dissolved, add pears. Reduce to a simmer and poach pears for 15-20 minutes until soft. Reserve liquid and cool to room temperature. Mix cheese, vanilla, heavy cream and honey together. Thin mixture with 3 tablespoons of the reserved liquid. Place 1 cup of the reserved liquid and orange zest in a heavy saucepan and bring to a boil. Reduce liquid to ⅔ of a cup. To serve place 2 tablespoons liquid mixture on each plate, place a pear on top and drizzle with cheese sauce. Garnish with mint leaves. May we suggest Ginger Snappish Herbal Tea - Case of 6 boxes - total of 120 teabags to pair with this recipe?